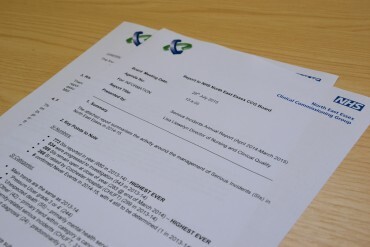 A report, written by Lisa Llewelyn, the Director of Nursing and Clinical Quality in North East Essex, to the board of the NHS North East Essex Clinical Commissioning Group, reveals that serious incidents reported in North East Essex between April 2014 and March 2015 have risen to their highest level ever at 773. Each month, all areas of the NHS (that is Hospital Trusts, GPs, The Ambulance Service, dentists etc.) are required to report to an NHS body called the National Reporting and Learning Service (NRLS) details of any adverse incidents that occur. This information is then collated and published on their website twice yearly, in March and September. The information is accessible to anyone – so if you were interested, for example, you could view the report specifically relating to Colchester Hospital. You can read more on the latest statistics they have published here. The report to the Board Meeting on 28th July has also confirmed that during 2014-15 there were 6 Never Events. In the medical world a “Never Event” is described as a serious, largely preventable patient safety incident that should simply never happen if all available preventative measures have been implemented. However, “Never Events” do unfortunately occasionally occur. The NHS classifies 25 types of “Never Event”. To read more about “Never Events” click here. • Of the total of 773 serious incidents 368 took place at Colchester General Hospital. If you have been affected by one of these serious incidents and think that you may have been the victim of medical negligence the experienced team at TSP can help. To find out more about how we can help click here or to contact our team click here. We offer a free of charge, no obligation interview, which can take place either on the telephone or in person, and there are a number of funding options for your claim which we are happy to discuss with you.